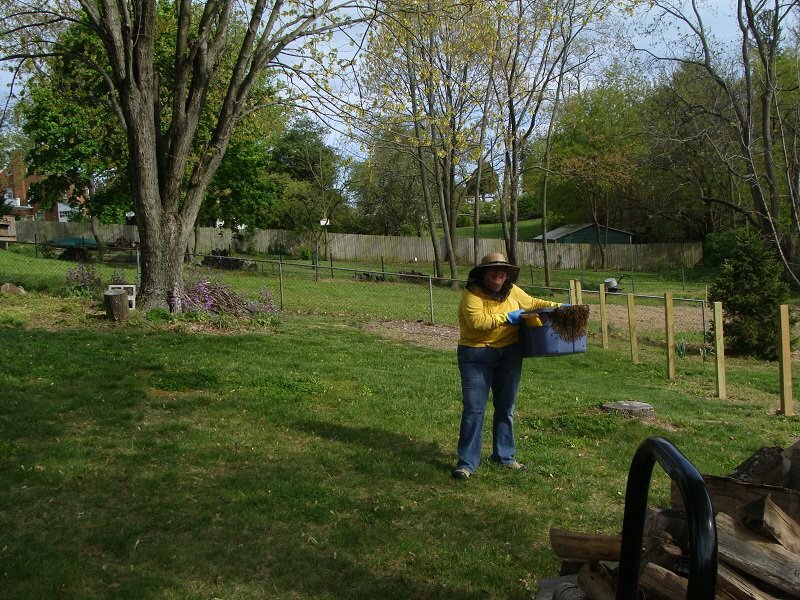 Tonia Moxley, avid writer, cook and gardener, shares the story of how she’s made room for bees in her backyard, like so many others experimenting in the urban agriculture movement, and why that journey has brought her closer to understanding her Appalachian heritage. CHRISTIANSBURG, Va. – By the time I was born, there were no more bees. Not at my granny’s old homestead in Grayson County. Not at my daddy’s daddy’s old farm in Sparta, N.C. (which I didn’t know existed until I got my own bees). The whim came upon me over a beer at a chicken ranch in Montgomery County, owned by my friends Jim and Lisa. It’s not really a ranch, or even a farm, although it once was a farm. They love old-fashioned breeds of laying hens, eat eggs and sell a few on the side. They can beans and tomatoes out of their raised bed gardens and even grow some meat chickens for the freezer. But they aren’t farmers in the sense that my great-grandparents were farmers. Lisa’s a professor and Jim traded his silk ties and high-end business suits for a van full of tools to remodel bathrooms and build chicken tractors. But they didn’t have bees. And they wanted some. I sat, having a civilized beer on their patio, looking at the abandoned hive boxes another beekeeper had left there years ago. The bees starved or absconded and wax moths ate all the comb. I hadn’t been thinking about bees. I’d never mentioned them before. But as so often happens in mountain ballads, fate had set a course I could do nothing but follow. “I would love for you to keep bees here,” Jim said. He couldn’t keep them. Bee stings leave angry, spreading red welts on him. Although my English-German-Irish genes gave me a bad back, stomach troubles and an irritable disposition, I am blessed with no allergies. I can tromp through poison ivy and sleep like a baby. Bees can sting me and while I may jump and curse, I am no worse for it. New brood. Photo by Maureen Peters. As I was saying, fate intervened. Before long, Jim and I were chasing swarms 20 feet up maple trees and two feet off the ground in a bush. Then I joined the local beekeeper club, read books, took classes and found a mentor. 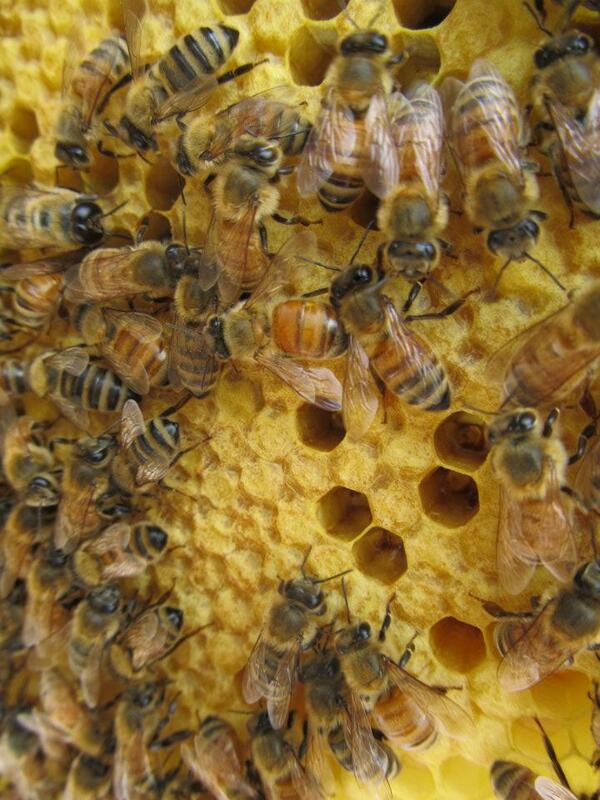 My letters back home were full of what I was doing this week with the bees, from feeding them the right mixture of sugar water to get them started building comb, to trying to spot the queens in my four hives – two in my garden, and two at the chicken ranch. And the letters started coming back filled with childhood memories of eating comb straight out the family hives, honey dripping down chins and sticking to tiny hands. I had never heard these stories before. “There’s nothing better than honey right out of the hive,” dad said. “Will you rob them? Nothing tastes better than fresh honey,” mom wrote. With beekeeping, as with so much of the mountain culture I had to learn about in college because I didn’t get it at home, I realized all over again the disconnection I suffered growing up. So many of us 40 and younger are of the mountains, but were not really a part of them. By the time I was a teenager, my people had sold or were selling the homeplaces, on both sides. I learned a little gardening. Helped with a little canning. I even had vague memories of Great-Grandpa Wingate slopping some pigs in the old barn. But my family lived in trailer parks and sat down at night to TV dinners, and pies that come out of box. My mother and grandmother saw the kitchen as a slave house, and loved the soulless, tasteless instant mashed potatoes and Little Debbie cakes piled in the shopping cart. The men in my family liked store-bought whiskey. First Swarm. Photo by Maureen Peters. But in beekeeping I found a new connection to the best parts of my heritage — a relation that stretched back beyond the mountains of home to the medieval forests of Europe. And even farther back, to Africa and Asia, where for eons we have stalked wild beehives to add precious sweetness to our harsh lives. This was not intentional, mind you. I didn’t plan it. I didn’t go looking for a heritage. Not on purpose. First I found interest in the woodworking with Jim, in the animal husbandry, the biology, the science, the sheer thrill of putting my face inches from 50,000 stinging insects clustered on a branch. Apis Mellifera, the common European honey bee is not native to America, or so researchers say. My people brought them from the forests of Germany and England to the hills of Virginia and North Carolina, and the bees, like the white settlers, recognized the forests and the farms, too. Old timers kept the bees in gums, hollowed out logs like their forest ancestors, or in woven skeps. Or they marked their bee trees, and dared any man to poach the bees or the honey. When my grandpa was little, every farmer had some hives near his apple and peach trees. The bees found sourwood that grows, Virginia Tech horticulture professor Holly Scoggins recently told our bee club, all over the rocky hillsides of the mountains. And the rich nectar from the snowy white flowers has made our mountain honey famous, and lucrative. Bee Work. Photo by Maureen Peters. yield quart jars of pure sourwood honey. Get the Mason or Kerr jars with the comb steeping in their golden depths. Take them home and pour the honey on your granny’s best buttermilk biscuits straight from the oven. That’s the taste of home. Nobody talked to me about bees and honey when I was growing up. The hives were all gone, gone with the family land that’s only history now. But the connection remains. I found it by accident, just trying a new hobby that I thought would help my cherry trees actually produce a crop this year. But it’s brought me so much more. It brought me back to my heritage. Now we’re spreading the bees again. The farms are mostly lost, but some of us have started to carve out homesteads in the suburbs and the cities. Reclaiming our self-reliant, pioneer ways, we demand again to keep our laying hens and our neat, painted bee hives in the backyard. The spirit remains. Like the bees, we adapt, we endure. And city councils are making way for us. We may work in the offices of downtown Roanoke, Va., or even New York City, but now we can go home to our bees. We can lie in the grass and watch a new crop of field bees cloud over our heads on their first flight. And in the fall, we can slip on our bee veil, light our smokers and rob honey, bare handed from our friends, being always careful to leave enough for them to make it through the winter. Like our granddaddies before us, we can eat warm honey straight from the hive. 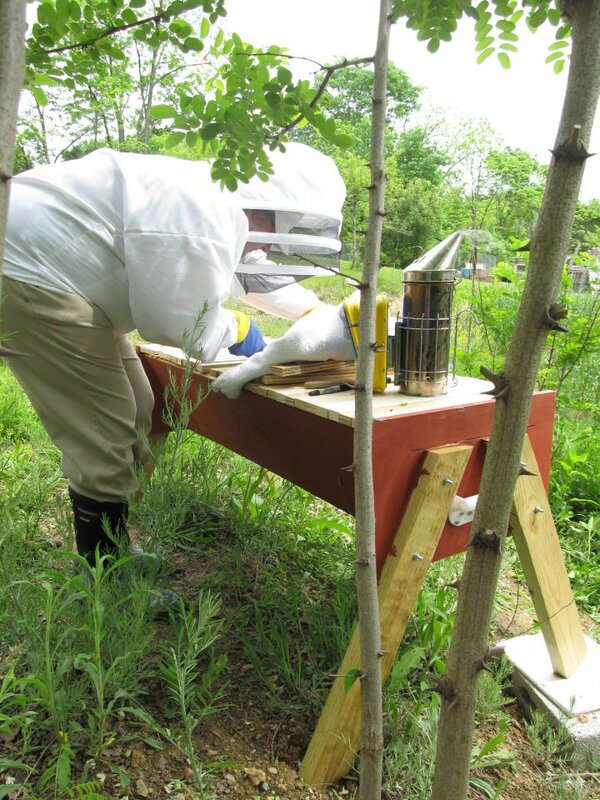 – “Foxfire 2” Eliot Wigginton and his students have chapters on sourwood honey and beekeeping. -“The World History of Beekeeping and Honey Hunting” Eva Crane surveys the ancient history of the craft, including European forest beekeeping and the immigrants who brought beekeeping to Southern Appalachia. -“Beekeeping Basics” published by the Penn State College of Agricultural Sciences Cooperative Extension, 2004 (also available as a free download at www.cas.psu.edu). Tonia Moxley is a Virginia-based journalist and freelance writer who excels in the kitchen, but dislikes shopping for a bathing suit. She is the publisher of biscuitpower.com, an online magazine exploring Appalachian foodways.